HCE and Golden Gate officials at the signing ceremony. 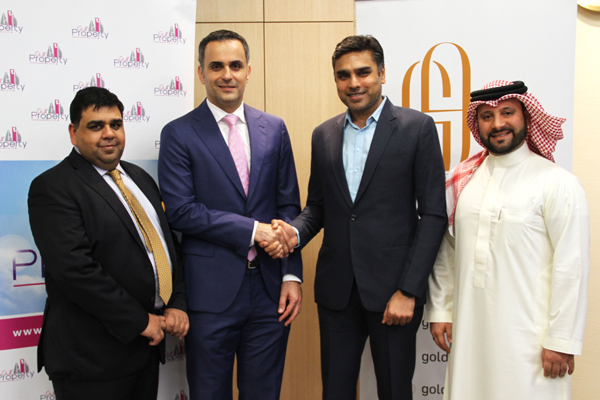 Golden Gate Developers, a joint venture between Kooheji Golden Gate and Indian real estate groups Ajmera Realty Group and Mayfair Housing, will be showcasing its $212-million twin residential tower project at the upcoming Gulf Property Show 2019. A dedicated boutique showcase for real estate and property development in Bahrain and the Northern Gulf, The Gulf Property Show will be held under the patronage of HRH Prince Khalifa bin Salman Al Khalifa, Prime Minister of the Kingdom of Bahrain, from April 23 to 25 at the Bahrain Exhibition Centre. Golden Gate is located in the heart of Bahrain Bay on one of the seven anchor lands in the development. Segregated from all sides with no adjoining building, the development features full road access and a walkway at the Wharf on the fourth, said the event organiser Hilal Conferences and Exhibitions (HCE). Anas Al Kooheji, the Golden Gate executive director and board member, said: "Bahrain Bay is an attractive central location for investors. As Gold Sponsors of Bahrain’s leading real estate event, we will be promoting a lifestyle opportunity for buyers and investors visiting the Gulf Property Show." The first eight storeys in the Golden Gate are dedicated residents' car parking – three basement levels and then from levels two to six – the façade of which resembles jewellery boxes used in India. Eman Al Mannai, vice president of sales and marketing, stated that with 140,000 sq m of built-up space and with stunning views, the premium development will provide residents luxury canal and seaside living, easy access to a wealth of amenities and nearby links to both local and international transport connections. "Our vision for Golden Gate is to create a property landmark within Bahrain Bay which will be renowned for location, quality and a worthy address to support the luxury lifestyle envisaged for Bahrain Bay Area," noted Ajmera. "Golden Gate provides an exceptional value for money opportunity to be a resident in one of 746 residential innovative and luxurious units. The quality of the development will be on show for all to experience Gulf Property Show," stated Abdulrahman. The Northern Gulf’s “Window to Real Estate” Gulf Property Show 2019, highlights present and future developments in the region.